This is a vintage 1965 Fender Electric XII, sunburst. It has the “hockey” head. Great playing guitar for some parts. The Fender Electric XII was a purpose-built 12-string electric guitar, designed for folk rockers. Instead of using a Stratocaster-body style, it used one similar to a Jaguar/Jazzmaster body style. It was also a departure from the typical “Stratocaster”-style headstock, instead featuring a long headstock nicknamed the “hockey-stick” headstock. The Electric XII used a unique split pickup design and had a 4 way pickup selector allowing for neck, neck & bridge in series, neck & bridge in parallel and bridge only options. It also used a string-through-body design similar to a Telecaster to help increase sustain. Designed by Leo Fender, the Fender Electric XII was introduced in late 1965 with the bulk of the production taking place in 1966 before it was discontinued around 1970. Unlike its competitors’ electric 12-string models which were simply existing 6-string guitars with six extra strings, the Fender Electric XII was a purpose-built 12-string designed to capture a part of the folk-rock market. The bridge has an individual saddle for each string making precise intonation possible. The Electric XII was not particularly popular during its run, and by 1969, it was dropped from the Fender line. 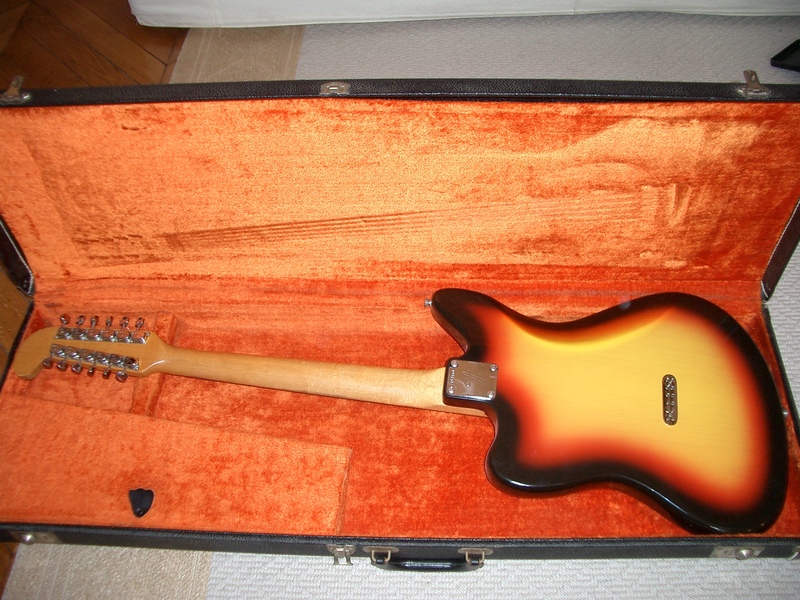 The body overstock was used for the Fender Custom (aka Fender Maverick). Some notable users of the Electric XII were Pete Townshend, who used it extensively on the album Tommy, folk-rocker Tim Buckley, and Jimmy Page, who used it on Led Zeppelin‘s famous Stairway to Heaven on the studio recording and on Jeff Beck‘s, Beck’s Bolero. Pye Hastings used one during the early days of prog-rockers Caravan, notably on their seminal album For Girls Who Grow Plump In The Night in 1973. Johnny Winter also used one briefly (strung as a regular six-string) during the late 1960s and early 1970s. Lou Reed and Sterling Morrison purchased matching Fender XIIs before the sessions for the Velvet Underground‘s eponymous third album in 1968. Krist Novoselic also played the Fender XII while he was in Sweet 75. The Verve guitarist Nick McCabe used a Fender Electric XII for live performances on the band’s 2008 comeback tour, notably on ‘Space and Time’ from their 1997 album Urban Hymns. You can also see Gustavo Cerati of Soda Stereo with a Fender XII in the videos of “En la ciudad de la furia” (“In fury’s city”) and “de Música ligera” (“of light music”). Tom Petty used a white Fender XII for the first half of his 2006 North American Tour instead of his signature Rickenbacker 12-string. Eric Clapton used it for the recording of “Dance the Night Away” with the band Cream in 1967. John Paisano, the “official” guitarist of Herb Alpert and the Tijuana Brass used the Fender Electric XII extensively. It is best heard in the intro of their recording of “Wade in the Water“. The guitar is also seen played by Steve Bartek on the Oingo Boingo Farewell DVD/video. Jason Mozersky of Relentless7 also uses an Electric XII.